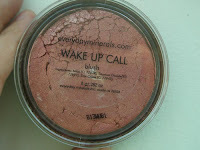 description of wake up call from the everyday minerals website: Just what you need for that night out with friends or a day on the couch with your favorite show, a glorious medium rosey shade with a tasteful and versatile shimmer. the colour is actually a raspberry colour with pink and gold shimmer. it might be a bit strong for girls with a fairer complexion than mine. the first time i tried to put it on i totally underestimated the strength of the pigment. the colour does come out pretty dark if you're not careful. i ended up with a long very very red streak of colour on my cheekbones. almost like warpaint. i was extremely careful with application the second time i tried it, making sure that i picked up very little on my brush and that the powder was evenly distributed on the brush bristles before applying to cheek. thin layer by layer is the way to go to avoid the overkill. you don't need a whole lot of the blush to get the colour to stand out. verdict: i love this colour! no regrets getting it at all and its going to last me a very long time since i don't need that much powder to achieve the desired effect. for skin tone like mine, it will make a very nice lip colour too. as an eyeshadow? i'm going to pass on that, the colour's not going to go too great with my brown eyes. not that i really wear eyeshadow anyway. BUT I have bought more things from them, due to the new sale! They are taking longer, but I was impressed with the stuff I got. Anyway thanks for showing the true colours of Wakeup Call. It is lovely. thanks for stopping by :) i'm a new edm addict and i don't see that going away for a looooooong time. do you have a blog of your own? hi farrah! just wanted to say thanks for posting these pictures of wake up call :) EDM is planning to discontinue this color so i'm going to order it now that i've seen how lovely it is. take care!